Are you trying to find a way to convert large format documents into digital files and just don’t think it’s possible? You’ve found the right place because we have the solution for you. We specialize in many document scanning solutions within those we specialize in providing large format document scanning services for companies of all sizes that have oversize or wide format documents. Need it in color or black or white? We can scan them in any way, shape, or format to fit the needs of your project and organization. We also offer large format scanning for blueprints of all sizes. Due to the size of blueprints and the details they include, scanning them is the perfect way to preserve them for longtime storage and use. From private companies to local governments, blueprint scanning is a standard service we offer at Business Systems & Consultants, Inc. These documents, because of their large size, can be quite difficult to maneuver, organize, and store. They may be rolled up and thrown in a storage closet or above a shelf, but we can help you with this situation. Large document scanning allows those larger documents to be transformed into digital files. These digital files can easily be stored on a desktop computer, shared drive, or on a USB drive. How simple is that? They are much easier to label, organize, and share. Could you imagine being able to simply email a blueprint to a client instead of having to figure out a way to mail it or deliver it with the thought of it possibly getting ruined in that transition? Tasks and processes can change for the better when large format scanning becomes a part of every day business. What Are Some Benefits of Large Format Document Scanning? Improved Document Control: Paper documents create clutter and mess in your office, they tend to get shoved in spare storage closets and extra boxes that become an eye sore. Digital documents can exist right on your computer or flash drive and are securely protected. Centrally Scanned and Indexed: We get the hard work done for you, so you don’t have to deal with the hassle and bulky documents. 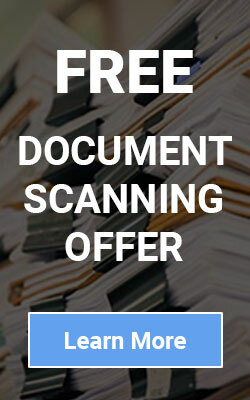 We scan all your large documents into a central, digital location. As we scan, the documents can easily be labeled and categorized to make it easy to retrieve at a later time. Simply send your documents to us, or allow us to pick them up for you, and in the blink of an eye, they are available right on your computer. Searchable and Accessible: After the scanning process is complete, digital files can be keyword searched for easy access. It’s just like searching Google, but instead you have your documents right at the tips of your fingers. Increased Office Space: All that clutter that was laying around the office has just become open space because you no longer have to look at those boxes of documents lying around. Instead you have all your documents on a secure file on your computer. Enhanced Productivity: Digital files that are easier to find, move and access simply make everyone’s job easier to complete. Some companies report that increased productivity is due to the fact that employees didn’t have to spend hours searching through boxes of documents when they can easily access it right on their computers. Archive and Store: Digital files can be securely archived. Instead of taking up physical space, the digital versions can be stored on a drive, in the cloud, or on an internal computer/server system. This will save you time, space, and money. BSC makes large format scanning as easy as possible or our image enhancement technologies guarantee you the best image quality. The first step is a consultation to find out your specific needs and how we can help you. During the consultation we go over what is expected, the scope of the project as well as look at the large format files that need to be scanned. The second step is getting those physical files picked up and scanned. We are here to make get your company the success it deserves. Give us a call at (205)988-3300 or email us at info@bscsolutions.com for more information.